1Now the LORD said to Moses, 2“Make two trumpets of beaten silver to be used for summoning the people to assemble and for signaling the breaking of camp. I didn’t get very far in today’s Resting at the River’s Edge reading. I started with Numbers 10:1. I ended with Numbers 10:2. Sometimes God interrupts us after only a verse or two. That’s OK! Don’t rush past the whisper of God. Pause and camp out a bit! You can always catch up on your reading tomorrow or the next day or over the weekend. Never push to finish reading when God highlights a verse and speaks into your spirit. When the trumpet sounds pack up your things, saddle up your horses (donkeys, camels, minivan, whatever) and let’s move! This place you’re at now – it’s just your current campsite. God is going to blow the trumpet and it’ll be time to move on. When the trumpet sounds, there will be no packing up of our things or saddling up of our horses – we will rise from our graves or be caught up in the clouds supernaturally to meet the Lord in the air! Whew! I remember a dream I had about thirty years ago. I was a relatively new Christian. Studying the rapture was all the rave then. I had one of those dreams that are so realistic when you wake up you can’t believe you were dreaming. We were in swirling winds that had the force of a tornado but wasn’t being at all destructive. We were initially frightened, but then instantly had a knowing that this was the rapture – that we were being transported to be with the Lord. Our fear immediately turned to incredible excitement and joy! Wow! What this passage and my dream remind me is that we are just passing through this life. This is our (very) temporary camping place. Phil did a study on heaven and in preaching called this life a “cheap motel” compared to the home that awaits us. He’s right. We’re just living in a temporary, cheap motel, folks. And one day…ONE DAY…We shall hear the trumpet sound and whether we’re dead or alive, we will rise to meet Him in the air…and remain with Him forever! Did you catch that part of the verse, too – we will remain with Him forever. That won’t be a temporary camp. That’s our permanent home. So while we’re living here on earth, while we’re living in this temporary home, don’t load yourself down with stuff you have to pack and carry when it’s time to break up camp. Instead, build a trousseau for your marriage to the King of Kings – build up treasures in heaven. Tomorrow’s blog – How do we do that? How do we build up treasures in heaven? Stay tuned…In the meantime, travel light because one day the trumpet will sound! We are being obedient to God’s will. Obedience is always honored by God. It keeps us humble by regularly reminding us that we’re not the source of all the good things that happen in our lives. It builds our faith by reminding us of God’s faithfulness and goodness to us. It shelters us from the sin of ingratitude. Two blogs ago, I wrote about the direct connection between an attitude of gratefulness and being made whole mind, body and spirit. We see the antithesis of that in this verse – that there is a direct connection between an ungrateful heart and a spiritual darkness that brings confusion and foolish actions. When we discipline ourselves to consistently and regularly rejoice over what God has done in our lives, we reinforce in our minds (and spirits) truths about who God is and how He interacts with His people. When we allow complaining and whining to take center stage, we reinforce lies that the enemy is whispering in our ears – God doesn’t love me, God won’t provide what I need, God isn’t interested in blessing me, God is not good to me. Our thinking becomes “futile” and we begin to think up “foolish ideas” about God, His character and His actions. Ultimately, our hearts and minds become “dark and confused.” That sounds a lot like depression to me. I’ve experienced serious depression. Dark and confused does a pretty good job of describing it. I didn’t like it. I prefer the happy face of celebration. I’m not saying that all depression can be healed by giving thanks, but it’s a fantastic way to start…and I’m confident that some depression is healed through this spiritual discipline. Why? Because when I am regularly reminded that all I have comes from God and that He is constantly faithful in my life, it develops a sense of contentment and peace in the very center of my being. And I like that. A lot. So, friends, this Christmas season, what is at the forefront of your mind – the stress of the season, or the blessings from a God who gave up heaven so that we might one day gain it? Let’s agree to focus on the latter and to regularly give thanks for the innumerable ways He’s blessed us. It will significantly impact your Christmas season. To be silent over God’s mercies is to incur the guilt of ingratitude…To forget to praise God is to refuse to benefit ourselves; for praise, like prayer, is one great means of promoting the growth of the spiritual life. It helps to remove our burdens, to excite our hope, to increase our faith. It is a healthful and invigorating exercise which quickens the pulse of the believer, and nerves him for fresh enterprises in his Master’s service. But how can such a simple discipline have such a huge impact? Supernaturally, of course! But there is logic to it! When we give thanks, it is an acknowledgement to God and the world, that all that we have comes from the Hand of God. It reminds us that we’re not the source of all the good that happens in our lives. That brings us to a place of humility. And that’s like an insurance policy against pride. When we give thanks, then, we are nurturing our humility and God gives grace to the humble. Developing a thankful heart puts us in a position to receive God’s grace. God’s salvation is found in the grace that He pours out on the heart that is humble. When we strengthen our muscle of thanksgiving, it shelters us from the sin of ingratitude. It shows that we don’t take God’s gifts for granted. The act of giving thanks keeps us from becoming ungrateful. When we give thanks, we are reminding ourselves of God’s constant faithfulness in our lives and that builds our faith. 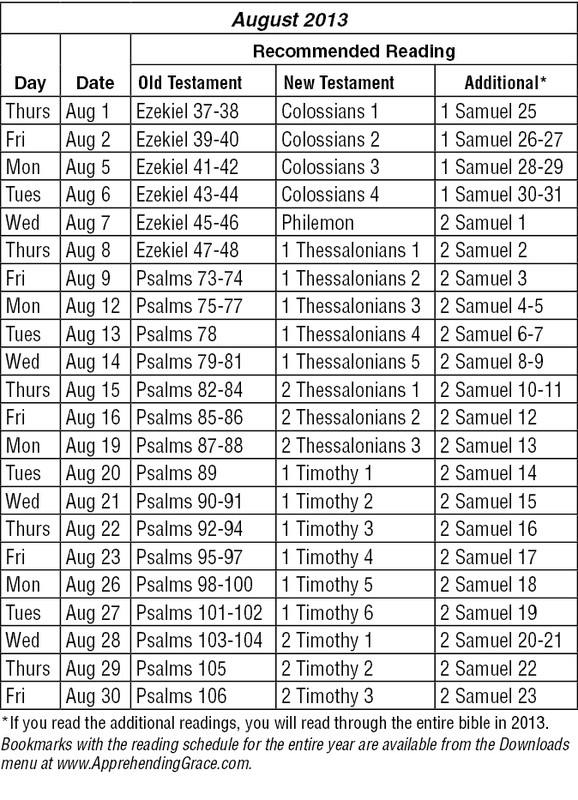 The Israelites were instructed again and again to REMEMBER what God had done and to give thanks for it. They were instructed to teach their children what God had done. Why? Because it built their faith. If God had parted the Red Sea to save them from the Egyptian army and sure defeat, he could be trusted to beat any current enemy they were facing. If He had provided manna in the desert and made bitter water pure, He could be trusted to provide food those things in their lives again. When we give thanks, we are reminding ourselves of God’s faithfulness – and that brings hope and an expectation that what He has done in the past, He will do again in our present and in the future. I sure need that. I love the Lord and have faith that He is always with me, that all He does is for my good, that He will provide for my needs, that He will…you get the idea. Yet I sure need to remind myself of what he’s done in the past sometimes. When I’m tired or stressed or frustrated or discouraged or…again, you get the idea. At those times, my faith needs to be reminded that we’ve been here before and God has shown up in a mighty way. He always has. He always will. There is at least one additional benefit of giving thanks – When we give thanks, we are being obedient to God. It doesn’t get much clearer than that – it is God’s will that we give thanks in all circumstances. Not for all circumstances, but in all circumstances. There are always things to give thanks for, even in the worst of circumstances. And when we find those things (especially in the worst of circumstances), we are humbling ourselves, we are honoring God, we are and we are putting ourselves in a position for God to show us His great salavation. Just as the ten lepers were being obedient as they went to show themselves to the priest (Luke 17:11-19), when we give thanks, we are being obedient to what God has told us to do. And the faithful God that we serve will bless that thankfulness, just as he blessed the obedience of the lepers. God doesn’t just tell us to do things on a whim – He tells us to do things that are for our good – to teach us to live a life that blesses Him and that He in turn can bless. He commands us to do things because they’re good for us! So when we give thanks, we experience blessings beyond simply the assurance of having been obedient. Tomorrow’s blog – The High Cost of Not Giving Thanks! Give Thanks – It’s God’s Will For You! We live in the midst of a culture that specializes in complaining, but God encourages us to be counter-culture. No, that’s not correct. God does more than encourage us to be counter-culture – He makes it clear that it is His will for us. Did you catch that? God’s will for you is that you give thanks. Put another way, you are fulfilling God’s will for your life when you are giving thanks. OK, perhaps not God’s entire will for your life, but His will never-the-less. Let’s take it to heart this month – in everything, give thanks – for this is the will of God in Christ Jesus for you. Many people are putting a daily message on Facebook proclaiming their thankfulness to God. Whether you make it public on Facebook, Tweet your thanks, add comments below this blog, or share your thanksgiving with your family – let’s make it a month of giving thanks – maybe it’ll turn into a lifestyle! Then we’ll be fulfilling God’s will for our lives. As for me, I’ll start the month by being thankful to God for the purposes and plans He has for me and His enabling power to grow into those purposes and plans. I’m thankful that 32 years ago God opened my eyes to His great love for me and I invited Christ to be Savior of my life. What a good God He is! Comments Off on Give Thanks – It’s God’s Will For You! Resting at the River’s Edge in October – Dry Bones, the River of Life and so much more! 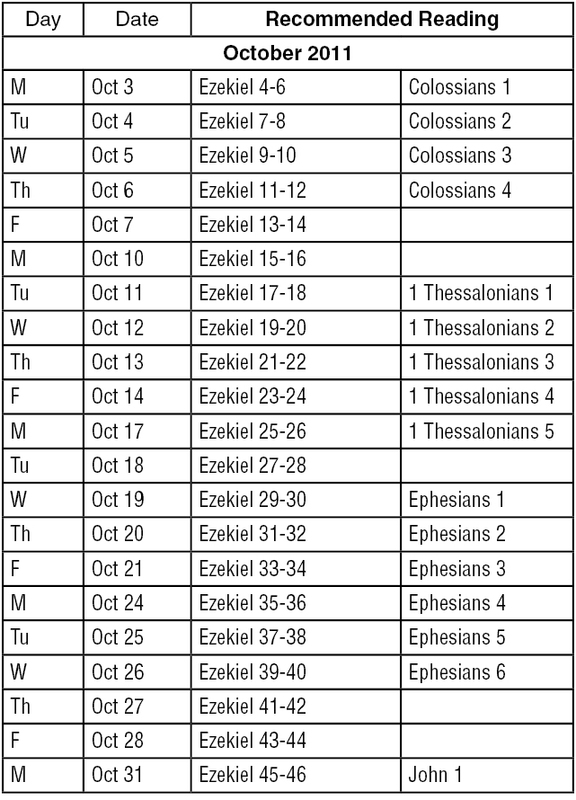 Most of our Resting at the River’s Edge readings this month will be in the book of Ezekiel. Tradition has it that Jews were not allowed to read this book until they were thirty years old! It’s some heavy stuff! But it’s stuff we love. We’ll read about the Valley of Dry Bones. Pray as you read that God will breathe life into areas of your life that might be dry, and that He will show people that you are to prophecy the breath of life into. Ah – you gotta read the great stuff for yourself! Enjoy the fall blustery days by reading a good book next to a window – I recommend the Bible. 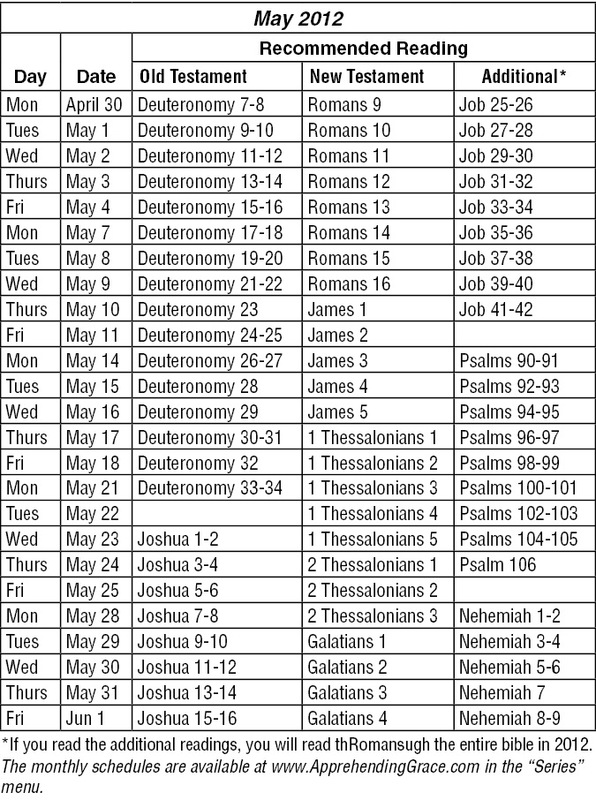 To download a PDF of the October 2011 recommended reading plan, click here. Comments Off on Resting at the River’s Edge in October – Dry Bones, the River of Life and so much more! Yesterday was the first Sunday of Lent, a season that is well known to many Christians and hardly on their radar for others. One of the things I like about it is that it is observed by Christians around the world – when we observe the season, we are joining with the Body of Christ worldwide. I come from a church tradition that barely recognizes Lent so I thought it’d be a great opportunity to do a little research. What I’ve learned is motivating me to set apart this season as a time to pursue God more diligently by returning to the basic disciplines that were the hallmark of early Christians. Before we look at those disciplines, let’s look at the original purpose for Lent. Understanding what something was meant to do helps us to use it properly. If you’ve never seen a fork before, and I give you one without telling you what its purpose is, you might come up with some unusual things to do with the fork. You might use it as a decorative hair pin, or take two of them and intertwine them to create a structure of some sort. While you can do those things with a fork, what it is best suited for is eating. So first we want to look at the original purpose for Lent. Let’s look briefly about each of these areas. 17pray continually; 18give thanks in all circumstances, for this is God’s will for you in Christ Jesus. During this season of Lent, I want to be more diligent about setting aside time to pursue God in prayer. Will you join me? Let’s agree among one another to make an appointment to meet God in a quiet place and pray each day during lent. This second focus of the new believers in the early church who were preparing to be baptized on Easter morning was a key message of the New Testament. Both John the Baptist and Jesus said repeatedly “Repent, for the Kingdom of God is at hand.” Repentance is more than feeling sorry for our sin. It means changing our mind about what we did and agreeing with God that it is sin. There’s a big difference between asking God to forgive us of our sins, or even being sorry for our sins, and agreeing with God that what we did was a sin. Repentance requires changing our mind and then our behavior. And for our mind to be changed, we need to approach God humbly, with an attitude of humility, saying “Lord, I want to do your will. Forgive me and change my heart.” And then we need to listen. So during our prayer times during Lent, let’s approach God humbly and ask Him to teach us His ways. This is perhaps the most common practice people participate in during Lent. “What are you giving up for Lent?” is a question we hear (and perhaps ask). I want to focus on fasting a little differently. First, I want to focus on the purpose of fasting. We are not fasting because it’s the season in which we’re supposed to give something up. It’s easy to fall into that trap. I want to go further and constantly remember that I am fasting to draw closer to God. I want the truth that Jesus spoke about when He said “Man does not live on bread alone, but on every word that comes from the mouth of God.” to be a reality in my life. So we humble ourselves through fasting and turn to God to be filled. Fasting reminds us that we are weak (because we so want that thing we’ve given up) and we turn to God for His strength. During your prayer time in the next couple of days, ask God how He would like you to participate in fasting. It might be that giving up some type of food will come to mind. I’d like to invite you to think about other kinds of fasting. For example, you might fast from television during certain times of the day. Or you might give up some other activity and spend the time in prayer and Bible reading. We don’t give so that we’ll get back, but God in His goodness blesses us. Phil and I started this without realizing it when we spontaneously gave more than we were required to and more than we had anticipated giving. I’m hoping God reveals an opportunity to be generous each week during Lent. I want to encourage you pray about increasing your giving during this season. Give generously – share what you have with those around you. That was the emphasis of study for the new believers during the Lent season: prayer, repentance, fasting and giving. Some may wonder why we have to do it every year, even if we’ve been a Christian for most of our lives. The answer to that is simple. We don’t have to, but it is our privilege to do so. Practicing these four basics disciplines of our faith creates and reinforces an attitude of humility and puts us in a position to hear from God. Let me know what He’s saying to you! First, a confession! I stole the headline from a blog about giving yourself permission to do those things you tell yourself you’re going to do “someday.” I immediately thought of the new Living Life on Purpose groups I’m organizing. The groups aren’t about giving ourselves permission, but rather about helping ourselves lead the Godly lives He wants us to live. Purpose groups may meet in person, or they may meet “virtually” – over the phone and/or via our computers. If you’ve never participated in a virtual group before, don’t let that keep you from joining us. I’m a member of a virtual group for business and it works wonderfully. My prayer for the Purpose groups is that they help group members move from “someday” to “action” in the area of their life that is more important than all other areas – their relationship with God. If you’re considering joining us, comment on the blog, post a message on facebook, or e-mail me. Let’s make 2011 the year we grow closer to God!